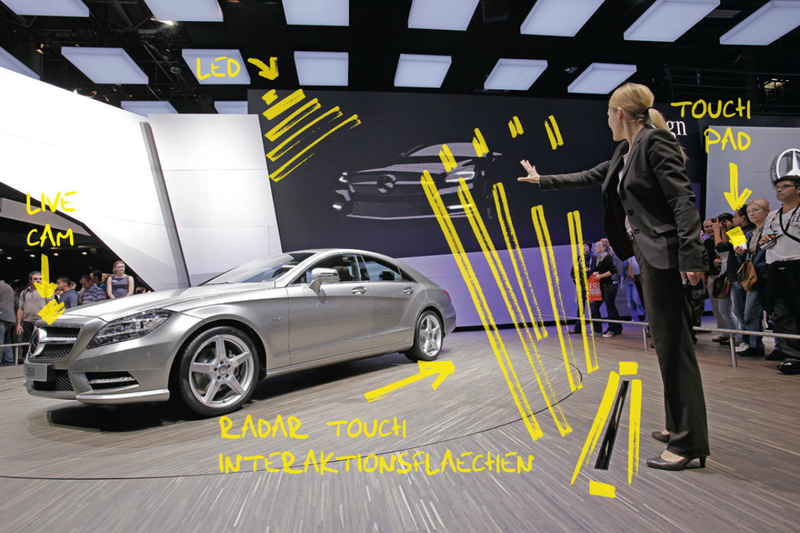 It consists of a car on a rotating platform, a large LED screen, a live Augmented Reality camera inside the car, Radartouch interaction areas, iPads for visitors and a moderator. All together create one seamless multimedia spectacle. Via iPads the visitors can vote at the beginning of the show what they are most interested in and the show unfolds accordingly. The Radartouch areas are like invisible touch screen which allow the moderator to control the show, interact with on screen objects and even draw in mid air. When the hood of the car is opened a camera mounted inside shows the real motor on the LED screen. Now via Augmented Reality it is possible to remove top layers and give an inside view of the engine. Further, the moderator grabs importent parts and brings them onto the LED where animations explain the inner details.